Drumroll please, it’s the moment you’ve all been waiting for! 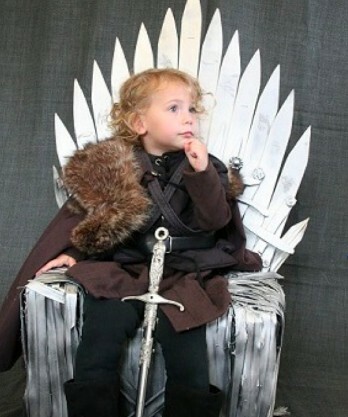 The winning costumes of our Green Halloween Costume Contest will now be revealed. 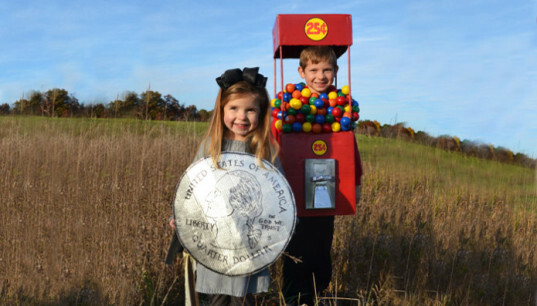 The level of imagination and resourcefulness was unparalleled this year, and we had a blast looking through all of your creative and inspiring entries. And now, without further adieu – the winning costumes! We thought that the brother-sister Gumball Machine & Little Miss Quarter repertoire was one of the most resourceful and realistic costumes we’ve ever seen! They win the Editors’ Choice Prize of a $100 gift certificate to Oeuf! Enjoy shopping from Oeuf‘s awesome selection of cuddly stuffed toys and gorgeous clothing and accessories, all hand-knit in Bolivia by a self-managed community of indigenous women. 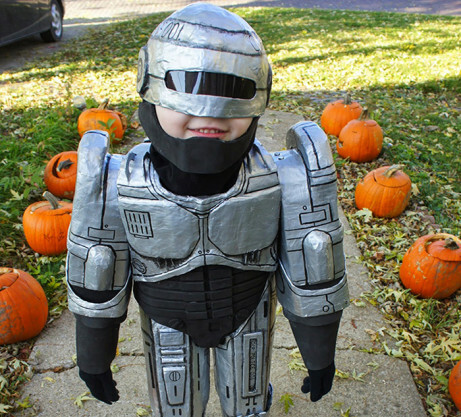 Livi’s renegade Robocop brought our readers back to the ’80’s with her flashback recycled cardboard and paper mache suit! 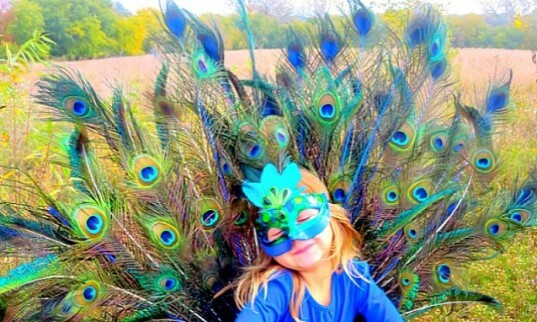 She will be taking home the Readers’ Choice Prize of a $100 gift certificate to Sarah’s Silks — beautiful playsilks and toys that inspire imaginative play and endless dress-up fun! The following winners will all receive a reusable Halloween ChicoBag brimming with CLIF Kid Monster Chocolate Mint ZBars and YumEarth organic lollipops! CLIF Kid Zbar Monster Chocolate Mint combines the flavors of chocolate with a hint of cool peppermint in a snack bar made with USDA-certified organic ingredients, 8 grams whole grains, plus 12 vitamins and minerals specific for kids’ growing bodies. It does not contain trans fats, hydrogenated oils, high fructose corn syrup, artificial flavors, colors or preservatives, or ingredients sourced from GMOs. YumEarth lollipops are vegan and gluten-free and contain NO artificial colors, artificial flavors, high fructose corn syrup or nuts. Their many yummy varieties of lollies (from pomegranate pucker to razzmatazz berry) are certified 100% organic and colored with non-chemical organic juices from fruits and veggies. 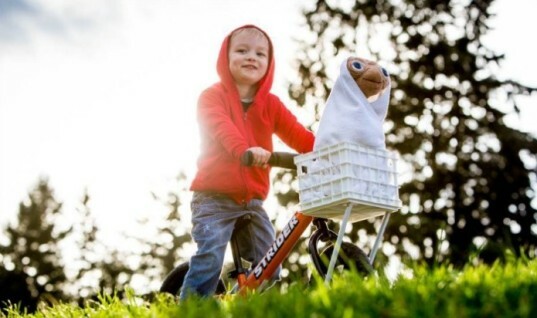 This little guy’s homemade E.T. was spot-on! Using a Strider Bike and a favorite stuffed animal, he nailed the perfect portrayal of a beloved childhood flick. 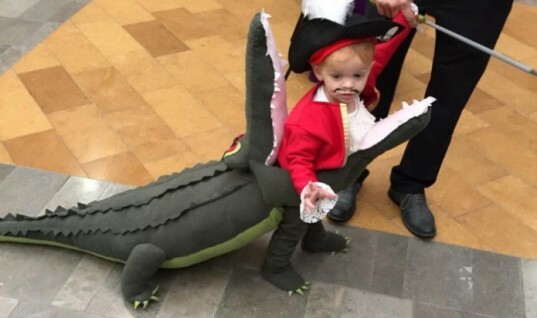 Captain Hook faces his ultimate demise in this hilarious handmade tribute! 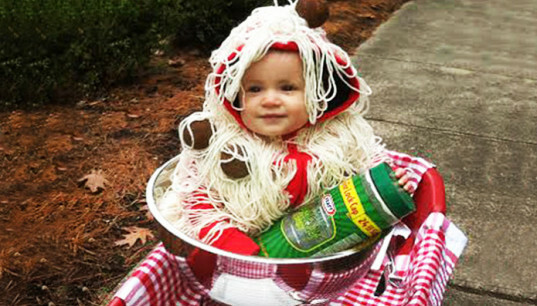 With a little bit of yarn and a lot of love, this cutie is instant Spaghetti and Meatballs. Reagan’s grandmother foraged for fallen peacock feathers to create this absolutely stunning and original work of art. The evil King Joffrey from HBO’s cult classic Game of Thrones is depicted every so slyly with a set of false legs and his handcrafted throne. 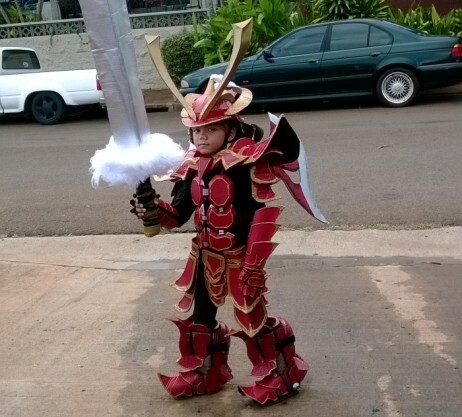 The gallant Mech Samurai Warrior is a recycled cardboard masterpiece, topped with a handmade sword twice the size of its warrior! A heartfelt THANK YOU to everyone who took the time to enter our contest! We were so impressed by the Inhabitots’ community’s ingenuity, resourcefulness and creativity! Drumroll please, it's the moment you've all been waiting for! 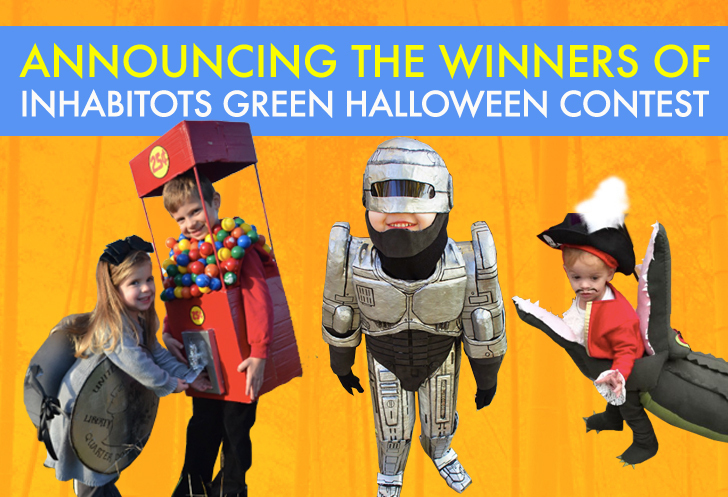 The winning costumes of our Green Halloween Costume Contest will now be revealed. The level of imagination and resourcefulness was unparalleled this year, and we had a blast looking through all of your creative and inspiring entries. And now, without further adieu - the winning costumes!